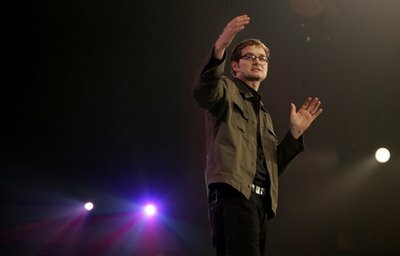 Jesus The Radical Pastor: ROB BELL: BACK STORY TO "THE LORD'S TABLE"
Once in a while I'll hear something that is crucial to the Christian faith take on new meaning and depth and wonder. This happened this past Sunday as Julie and I heard Rob Bell of Mars Hill Bible Church, Grandville, MI, speak about the Eucharist, or Communion, or the Lord's Table. Evangelicalism has a penchant for flattening everything out; of ironing the wonder out of the faith; of bleaching out the mystery in order to get a good, analytical grasp on things. Rob in a clear and simple talk resurrected the wonder and mystery and impact of the Lord's Table. I hope you will take time to hear Rob's talk. I'd be interested in your comments. Listen here. Scroll down to May 28, 2006 "There's a Bit More Going On Here"
I didn't realize until this past Saturday that you were back. I look forward to reading the posts I have missed. I am glad you stopped by and commented. It's good to be back. I've also been visiting your blogspot and have been deeply encouraged. that was an excellent take on the communion table. "Evangelicalism has a penchant for flattening everything out; of ironing the wonder out of the faith; of bleaching out the mystery in order to get a good, analytical grasp on things." I love this. I'm a mainline pastor who knows that evangelicalism isn't the only culprit.